It wasn’t perfect — and at times it wasn’t pretty — but the Vikings made the biggest plays in a game filled with them, holding off visiting Louisville for a 24-21 victory in the 94th meeting between the teams on Friday. “We held on for dear life at points,” Baum said, “but our defense did a good job stepping up and getting stops when we had to. Junior quarterback John Keller completed 13 of 18 passes for 163 yards and two touchdowns for the Vikings, who are 2-0 for the first time since 2012. That also happens to be the last time the Vikings made the playoffs. Nate George — whose below-average size (5-foot-7, 160 pounds) and above-average speed make him a good representative for the Vikings’ entire roster — added 70 yards on 11 carries, including a 33-yard touchdown run with 1:36 left in the first half that gave Hoover a commanding 24-7 lead. But Louisville needed less than three minutes to get back into it. First, the Leopards drove 74 yards in five plays, capped by Brody Hahn’s 49-yard touchdown pass to Tyler Adams with 18 seconds left in the half. The Leopards then recovered a fumble on the opening kickoff of the second half and scored two plays later on Hahn’s 38-yard pass to Jack Davis. It ended up being the last score of the game — barely — as Louisville had two touchdowns wiped out by penalty in the second half. The first came at the end of a 12-play drive late in the third quarter when the Leopards were whistled for offensive pass interference on what looked like a 21-yard touchdown pass. Then, midway through the fourth quarter, Louisville was called for holding on Adams’ 37-yard touchdown run. One play later, Hoover’s Donnie Genetin intercepted Hahn at the Vikings’ 10. The Vikings got one first down, then Eric Sarbaugh came up with a huge 66-yard punt that rolled out of bounds at the Leopards’ 4. 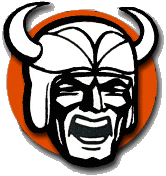 Hahn drove the Leopards to the Vikings’ 41, but the drive stalled thanks to four straight incompletions, allowing Hoover to run out the last 80 seconds. “We turned the ball over three times in the first half and dug ourselves in a big hole and couldn’t dig out of it,” said Louisville coach John DeMarco, whose team had to rally late last week to beat Canfield 21-17. “We’ve got to take care of our business. Hahn completed 19 of 34 passes for 274 yards with three interceptions. He also ran 17 times for 87 yards. Adams caught eight passes for 91 yards. Nick Binnie and Zach McHenry each had interceptions for the Vikings, while Genetin (80 yards) and Ben Harris (6 yards) each had touchdown receptions.